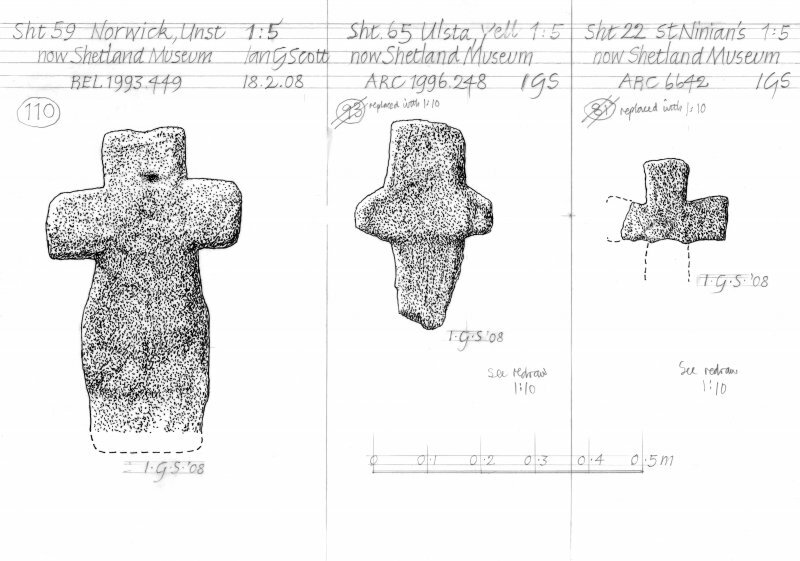 Drawing of carved stones one with cross detail. St Ninians, Ulsta, Noss and Baliasta. Present location: Shetland Museum, Lerwick (ARC 1996.248). Evidence for discovery: found during digging for cultivation on the site of the old burial ground in 1970. It was later presented to the museum. Present condition: the base of the shaft is broken. This is a small and relatively thin example of a cruciform stone, with a wide and high upper arm. References: Scott & Ritchie 2009, no 93. OS 6" map, Shetland, 2nd ed., (1900). A slight eminence marks the site of this pre- Reformation chapel. 'A few years ago a road was cut through the middle of the Burial Ground when the remains of the chapel, in the shape of stones and rubbish, were removed, also part of the Burial Ground, and some human remains brought to view. The portion of the Burial Ground west of the road is enclosed by an old bank, and cultivated and that on the east is rough pasture'. No trace of a chapel. There is a small turf- covered enclosure to the W of the site, possibly incorporating part of the old graveyard wall, but there are no remains to the E of the road. Visited by OS (NKB), 11 May 1969. HU 464 803 Crucifix medieval grave marker. Dug up in 1970, W of site of medieval church; 380 x 250 x 50mm (lower part broken). HU 464 804 Presumed pre-Norse house site, at same location as the medieval church site. House may also extend to E side of road. No trace of house discernible, but in 1990s burnt stones and ash were dug up, and a hammerstone was found in 1996.